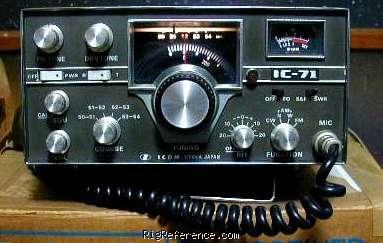 The ICOM IC-71 is a multi mode 6 meter transceiver. Got this in a trade in mint conditon, this was never sold to North America so it is a rare find along with the matching power supply.I had one of these in 1979 when AM and FM where still popular. Good selectivity and you can pretty much tell where you are on frequency. Have it listening for a beacon in BC. For the time that it came out it does what is supposed to do and on FM the sound quality is very good both on TX and RX. Plug and play, adjust the Drive tune and peak the PA for about 12 watts out. Estimating the value of a rig can be challenging. We collect prices paid by real hams over the years to help you estimate the current value of the ICOM IC-71. Just bought or sold this model? Let us know what you traded it for and help other ham operators!